Pardon my absence; I was on vacation with family on Cape Cod, enjoying lots of gin and seafood and gin. When I came back there was nothing to eat, so I dove right back into MarthaLand. Kabobs: Martha’s pork recipes have been Not Good, so I took her suggestion to switch out the meat to chicken (or lamb, she says). I used boneless, skinless chicken thighs marinated in the juice and zest of an orange, five garlic cloves, two tablespoons thyme, a tablespoon Dijon mustard, 1/4 cup olive oil, some salt and pepper. I was supposed to have chopped and skewered them on, well, skewers, but I was chasing daylight as it was, so I just threw them whole onto the grill. Glory be! They were delicious! I was expecting them to be too sweet because of the orange, but it wasn’t a detectable flavor; the meat was tender and tasty but still savory. It was good as leftovers. Was there some sort of fennel crisis while I was away? I had to go to four stores to find it. 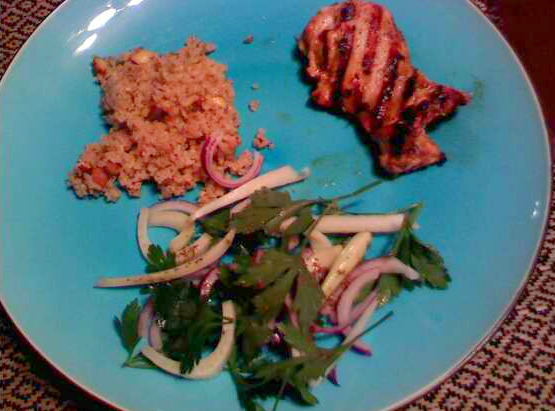 A fennel bulb was sliced, along with a small red onion, and combined with some flat leaf parsley. I had to put it in a colander in an ice bath (!) and let it sit for 15 minutes. This was supposed to make the red onion milder. I happen to like red onion in all its spicy glory, so this seemed weird to me–why not just use a yellow or white onion? It was also 103 degrees the day I made it, so I had to keep the ice bath in the frig, as it was too warm to have it on the counter. After the vegetables were drained, they were tossed with a dressing of lemon juice, olive oil, and celery seeds. I used an organic fennel bulb, which must have been undersized, as the recipe made a tiny amount of salad for four people. The onion to fennel ratio was off, according to The Husband. I, disliking fennel as I do, would have preferred the onion to be even more prominent. It also had too much parsley for my taste. I dunno–it was edible, but I would never eat it again, while The Husband enjoyed the leftovers. This was also tasty, and went quite well with the chicken! I cooked a cup of toasted bulgur in chicken broth with a cinnamon stick and a bay leaf, then added some chopped salted almonds and olive oil after it was done cooking. It was delicious until I ruined it. The pepper lid was not closed all the way and a ton of pepper fell into it. I tried to get most of it out, but it was still so peppery it burnt the tongue. 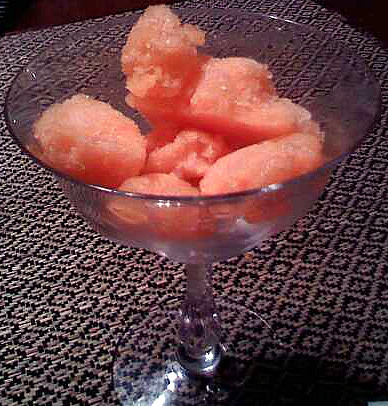 This was pureed cantaloupe mixed with a simple syrup (with lemon juice), then frozen/scraped much like the cherry ice from a couple of weeks ago. The Husband hates melon. How can one hate something so innocuous? It baffles the mind, really, especially when that someone likes fennel! And liver! I didn’t do all the scraping I was supposed to, so it got a tetch icy, but it had a nice flavor. It was cold and refreshing on a hot day, but it tasted exactly like a chilled cantaloupe you would eat fresh, so I’m not sure it’s worth the trouble. The Husband refused to look at it, much less taste it. OVERALL: A Kudos to Martha’s Underlings!